Yesterday I wrote about the horrific explosion that wrecked the Chicago and Northwestern powerhouse back in 1900, killing nine people and throwing the evening commute for 10,000 passengers into chaos. 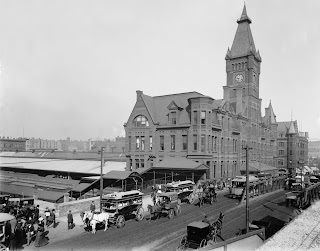 That station stood on Wells Street with the Chicago River to the west and south, Kinzie Street just to the north, and La Salle Street a block to the east, and it stood there from 1881 until 1911 when the C & NW moved to its new marble palace on Madison Street, just west of the river. That one is gone now, too. 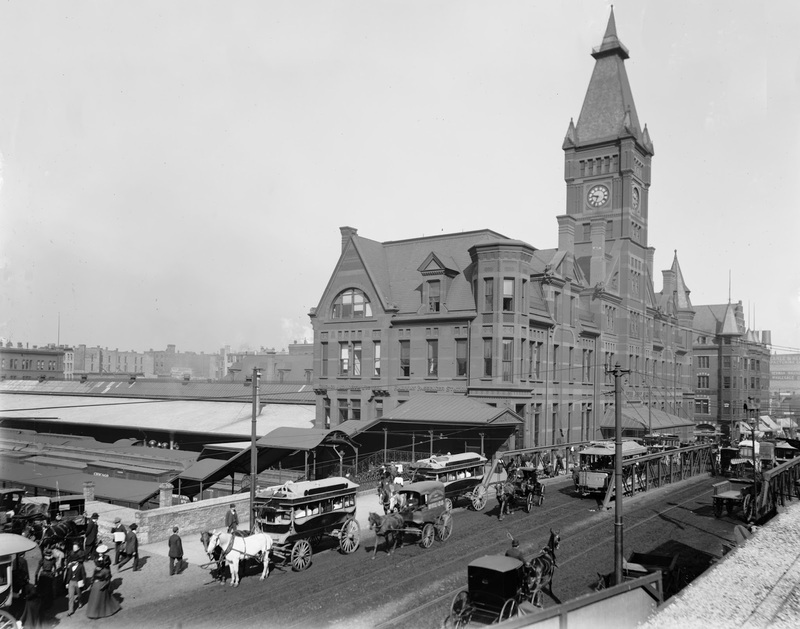 The very first railroad to serve Chicago was the Galena and Chicago Union, which built a station at Kinzie Street on the west side of the river in 1848. Its first run used the only available steam engine, a dozen years old and already hopelessly past its useful life, to make a run all the way out to Oak Park, hauling a load of wheat. When former mayor William B. Ogden and several other investors tried to raise the $365,000 they needed to make a going of the new road, the generous citizens of Chicago were so singularly unimpressed that they coughed up twenty grand. [Chicago Tribune]. From that inauspicious beginning things took off. Within seven years Chicago was the largest train center on the planet. By 1860, as war blackened the horizon, ten railroads called Chicago their home with trackage in excess of 4,000 miles. 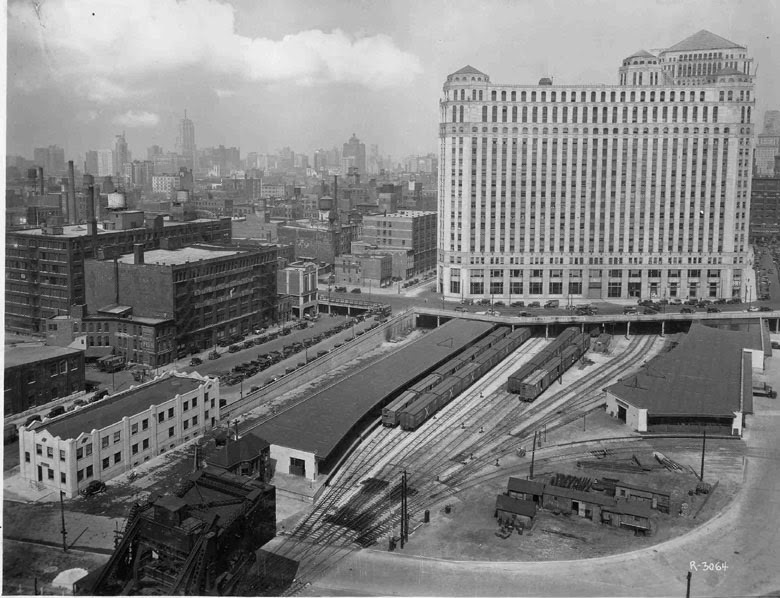 A lot of that track led to the landlocked Wells Street Station where the powerful Chicago and Northwestern Railroad, a line that had absorbed Mr. Ogden’s Galena and Chicago Union in 1864, tried to squeeze its immense bulk. 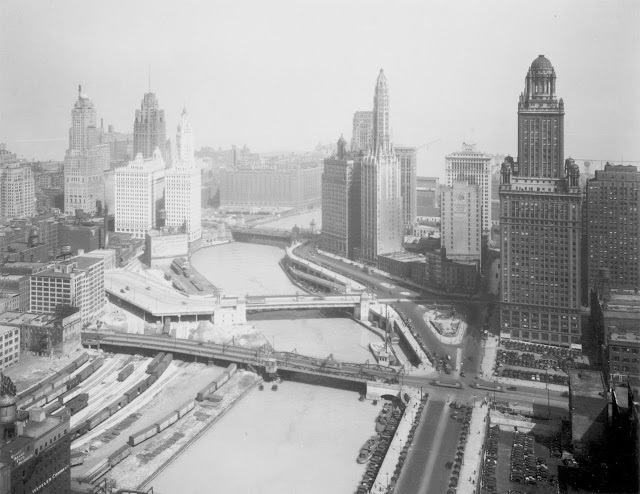 It was little wonder that at the end of the first decade of the twentieth century the road decided to build a half-dozen blocks to the south and on the west side of the river. Still, the trackage that crossed at Kinzie Street and filtered through the warehouse district on the north side was impressive. Here is what it looked like toward the end of the 1930’s . . .
You know what remains? 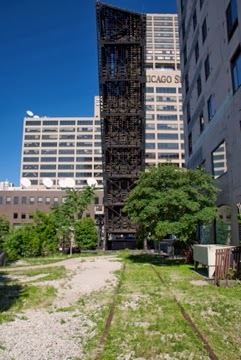 Walk up Canal Street, past Fulton House and you’ll find this ribbon of track, running beneath a chain link fence, stopping at the river with the old Kinzie Street railroad bridge giving it the finger from the east side. Time moves on . . .